When the numbers in a chart vary widely from data series to data series, or when you have mixed types of data (price and volume), plot one or more data series on a secondary vertical (value) axis. The scale of the secondary vertical axis shows the values for the associated data series. 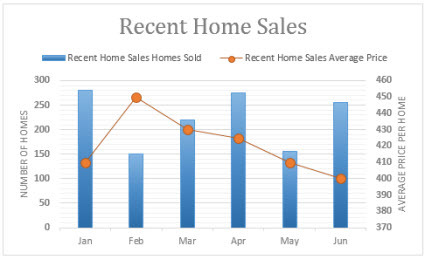 A secondary axis works well in a chart that shows a combination of column and line charts. You can quickly show a chart like this by changing your chart to a combo chart. Note: The following procedure applies to Office 2013 and newer versions. Looking for Office 2010 steps? Select a chart to open Chart Tools. Select Design > Change Chart Type. Select Combo > Cluster Column - Line on Secondary Axis. Select Secondary Axis for the data series you want to show. Select the drop-down arrow and choose Line. When the values in a 2-D chart vary widely from data series to data series, or when you have mixed types of data (for example, price and volume), you can plot one or more data series on a secondary vertical (value) axis. The scale of the secondary vertical axis reflects the values for the associated data series. After you add a secondary vertical axis to a 2-D chart, you can also add a secondary horizontal (category) axis, which may be useful in an xy (scatter) chart or bubble chart. To help distinguish the data series that are plotted on the secondary axis, you can change their chart type. For example, in a column chart, you could change the data series on the secondary axis to a line chart. Important: To complete the following procedures, you must have an existing 2-D chart. Secondary axes are not supported in 3-D charts. You can plot data on a secondary vertical axis one data series at a time. To plot more than one data series on the secondary vertical axis, repeat this procedure for each data series that you want to display on the secondary vertical axis. On the Format tab, in the Current Selection group, click the arrow in the Chart Elements box, and then click the data series that you want to plot along a secondary vertical axis. The Format Data Series dialog box is displayed. Note: If a different dialog box is displayed, repeat step 1 and make sure that you select a data series in the chart. On the Series Options tab, under Plot Series On, click Secondary Axis and then click Close. On the Layout tab, in the Axes group, click Axes. Click Secondary Vertical Axis, and then click the display option that you want. Right-click the secondary vertical axis, and then click Format Axis. Under Axis Options, select the options that you want to use. To complete this procedure, you must have a chart that displays a secondary vertical axis. To add a secondary vertical axis, see Add a secondary vertical axis. Click a chart that displays a secondary vertical axis. Click Secondary Horizontal Axis, and then click the display option that you want. In a chart, click the data series that you want to change. Tip: You can also right-click the data series, click Change Series Chart Type, and then continue with step 3. On the Design tab, in the Type group, click Change Chart Type. In the Change Chart Type dialog box, click a chart type that you want to use. The first box shows a list of chart type categories, and the second box shows the available chart types for each chart type category. For more information about the chart types that you can use, see Available chart types. Note: You can change the chart type of only one data series at a time. To change the chart type of more than one data series in the chart, repeat the steps of this procedure for each data series that you want to change. Click the chart that displays the secondary axis that you want to remove. On the Layout tab, in the Axes group, click Axes, click Secondary Vertical Axis or Secondary Horizontal Axis, and then click None. You can also click the secondary axis that you want to delete, and then press DELETE, or right-click the secondary axis, and then click Delete. To remove secondary axes immediately after you add them, click Undo on the Quick Access Toolbar, or press CTRL+Z. When the values in a chart vary widely from data series to data series, you can plot one or more data series on a secondary axis. A secondary axis can also be used as part of a combination chart when you have mixed types of data (for example, price and volume) in the same chart. In this chart, the primary vertical axis on the left is used for sales volumes, whereas the secondary vertical axis on the right side is for price figures. This step applies to Word for Mac only: On the View menu, click Print Layout. In the chart, select the data series that you want to plot on a secondary axis, and then click Chart Design tab on the ribbon. For example, in a line chart, click one of the lines in the chart, and all the data marker of that data series become selected. Click Add Chart Element > Axes > and select between Secondary Horizontal or Second Vertical. Click Add Chart Element > Axis Titles > and select between Secondary Horizontal or Second Vertical.